Easom Corporation is an authorized agent for Core Separator® technology sales in North America and provides complete systems as well as parts, service and technical support. The Core Separator technology was developed to improve the capture efficiency of micrometer and sub-micrometer sized particles from industrial exhaust gases. It uses a unique particle separator in conjunction with a conventional cyclone to achieve high particle collection efficiency. In terms of price and performance, Core Separator systems fall below baghouses and above cyclones and multi-clones. That is, they are generally less expensive and lower in performance than baghouses but more efficient and more expensive than cyclones or multi-clones. The enhanced performance is achieved while still maintaining the advantages of simplicity and robustness of a mechanical centrifugal particle collector. The system has only one moving part, a conventional centrifugal fan. 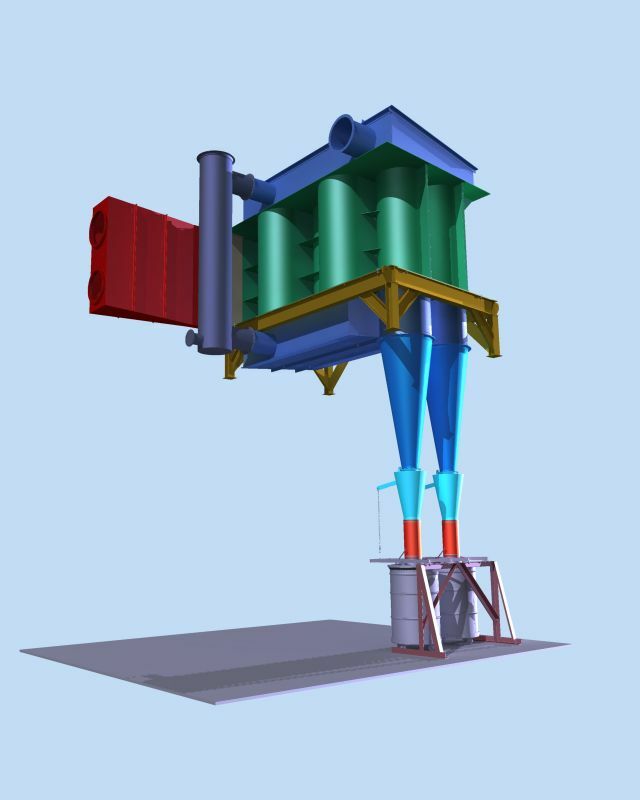 System depicted above shown without support frame legs or recirculation fan. Overall system height 21'-08" (6.6 m). Solids collected in two 55-gallon drums.